The recalcitrance of some creationist pupils when they are presented with evidence for Darwinian evolution cries out for an explanation and for a solution and in recent years a measure of mutual understanding has been provided by positioning the controversy within the context of worldviews. This chapter argues that now is the time to take that understanding further, especially in the light of the finding that such pupils in certain educational settings may be suffering anguish. What is the worldview inhabited by creationist pupils and what is its relation to science? 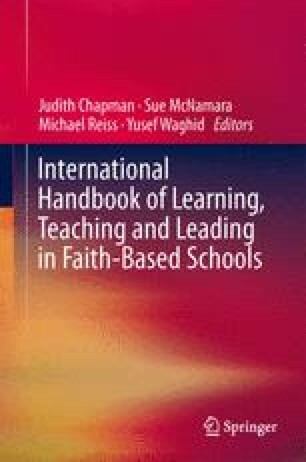 The chapter contends that many creationist pupils view the world in the same way as did the founders of modern science and that science teachers need to understand this in dealing with them. Within the United Kingdom a research population exists which is ideally placed to investigate the matter further. A network of small independent Christian schools have been in existence for up to 40 years which, generally speaking, are ‘creationist’ in their foundation. The teenage pupils attending the schools have been extensively surveyed for their beliefs concerning both religion and science. One important aspect to emerge from the survey concerns the significance of the Christian meta-narrative of ‘creation/fall/redemption/restoration’ which influenced early modern scientists and which creationist pupils may regard as providing a coherent framework within which scientific data can be interpreted. Once the data have been described, the relevance of this finding to the teaching of creationist pupils in other settings is then explored. BHA. (2013). http://humanism.org.uk. Accessed 6 Jan 2013. NCSE. (2013). http://ncse.com. Accessed 6 Jan 2013.